"I have made it quite clear to President [Mahinda] Rajapaksa that even though the fighting might be over, there are much more important things to be done. There is political reconciliation and reaching out to minority groups, including the Tamils, therefore, including the process for the accountability for any violation of international human rights law, international humanitarian laws. They must take all necessary measures. I have met already President Rajapaksa several times. I have called him to follow up my commitment after my visit." 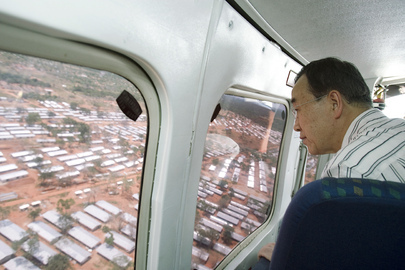 Ban's entourage knew that questions would be asked during his visit to Norway, in the wake of the leak of that country's deputy ambassador to the UN Mona Juul's devastating critique of what she called his lack of "moral authority," about his performance in Sri Lanka, as well as Myanmar and Sudan. Ban's spokesperson was asked about and shown the Sri Lanka execution video. Yet with all this preparation, what Ban did was refer with jargon to "the process for the accountability for any violation of international human rights law, international humanitarian laws. They must take all necessary measures." What does this mean? The Sri Lankan government, since Ban's visit, has canceled the investigation into killing such as those of 17 aid workers of Action Contre la Faim. It has rebuffed calls for any other investigations, and immediately denounced the airing of the execution video. Tellingly, its incoming ambassador to the UN Palitha Kohona was quoted over the weekend in the Daily Mirror that "a winning side has never been subjected to such an inquiry, including after the World War Two." Ignoring for example the indictment of still "winning" Sudanese president Omar al Bashir for war crimes, Kohona's appears to some to be a battle cry for impunity. Ban's response? The same talking points as three months ago. Ban's answers came in response to the second of only two questions taken after Ban met with Norwegian Prime Minister Jens Stoltenberg. Prior to that, Ban was to be met at the airport by Norway's Minister of the Environment and International Development Erik Solheim, who days ago said of the execution footage that "this is something I will discuss with Ban Ki-moon when he comes... even if the purpose of his trip is about climate and environment." Even after this, Ban had nothing but the same talking points to offer. "I have visited Myanmar twice and I have met Senior General Than Shwe three times. I have laid out a very strong message, straightforward, directly to the Senior General and even to the general public, [saying] what expectations we have for the Myanmar people. We were able to open up this society so that humanitarian assistance could flow smoothly. Last year, in the wake of Cyclone Nargis, together with the international community, particularly led by the Norwegian Government, we were able to save at least a half million [people] during the cyclone. Now, we need to work more for the democratization of Myanmar. I have made it quite clear, publicly and privately, that this election in 2010 must be a fair and credible and inclusive one. For that, all political prisoners, including Daw Aung San Suu Kyi, should be released. I am working very hard to keep up pressure on the commitments they made and you have my full commitment on that." When Ban was in Myanmar, a trip used by the government, he was not allowed to visit Aung San Suu Kyi. Shortly thereafter, a U.S. Senator, Jim Webb, was granted such a visit, and left the country with her co-defendant John Yettaw. The UN appears poised to offer what legitimacy it can to an election held under a Constitution pushed through after the Cyclone, which limits many seats and powers to those with military backgrounds. Still Ban claims he is pressuring Myanmar -- and that on Sri Lanka he has "met already President Rajapaksa several times. I have called him to follow up my commitment after my visit." Only last week, the head of the Colombo-based Center for Policy Alternative told the Press at the UN of widespread disappointment in Sri Lankan civil society that all Ban offered was a 24 hour visit and "a few phone calls." These critiques do not appear to have sunk in, the same talking points get repeated again and again, even in the face of evidence of summary executions. What's next? Watch this site. UNITED NATIONS, August 30 -- The video footage depicting the Sri Lankan Army committing summary executions will be raised to UN Secretary General Ban Ki-moon during his impending visit to Oslo, Norwegian Minister of the Environment and International Development Erik Solheim has vowed. On August 26 at a regular press briefing before Ban left New York, Inner City Press asked his Spokesperson Michele Montas if he or she had seen the footage, and for a UN Secretariat comment. There was no response to the video, and so the the link to the video was provided. In the four days since there has been no UN Secretariat* comment. Later on August 26 at a hastily convened stakeout in front of the UN Security Council, Inner City Press asked August's Council president and UK Ambassador John Sawers about the footage. He said he'd yet to see it but had read about it, and found it disturbing. He said the the UK would expect it to be investigated, by Sri Lanka in the first instance. Video here, from Minute 6:12. 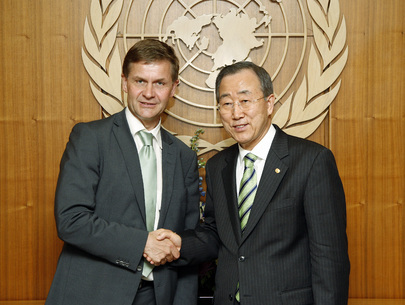 Sri Lanka has condemned Solheim for calling for a UN investigation. But it has not conducted any investigation of its own: its High Commissioner in London issued a denial as soon as the video came out. Is it Sri Lanka's vituperative reaction or something else, observers wonder, that is holding Ban back from commenting on the widely circulated video? This comes in the context not only of The Economist rating Ban three out of ten on speaking truth to power, but the more recent leaked memo by Norway's deputy ambassador to the UN criticizing Ban for, among other things, a lack of moral authority in connection with Sri Lanka and his belated visit there. So what will Ban say and do, when the issue is raised to him in Norway? Watch this site. Footnotes: Sawers also indicated that no Security Council member had yet requested a meeting about the execution video, just has he'd said no Council member asked for a meeting of any kind about the flooding of the UN-funded internment camps in Northern Sri Lanka. France speaks often about les droits de l'homme; the U.S. has an Office of War Crimes Issues which is preparing a report on Sri Lanka due on September 21. How long will the silence by these UN member states continue? * - The UN Human Rights Council's rapporteur on extrajudicial killings Philip Alston has called for an investigation. One wonders if this represents what Inner City Press had been told by a staffer was going to be High Commissioner for Human Rights Navi Pillay's response. UNITED NATIONS, August 26 -- When a war crime is filmed and presented to the UN, will it take action? On August 26, Inner City Press asked three officials at the UN about the now widely circulated video clip depicting Sri Lankan soldiers shooting naked, blindfolded victims in the head. At the noon briefing, Inner City Press asked UN Spokesperson Michele Montas about "footage of what appears to be Sri Lankan soldiers shooting naked, bound, unarmed people [inaudible]. Is there any response by the UN to that footage?" There was not. Later another UN official said that the Office of the High Commissioner for Human Rights is considering how to authenticate the footage, perhaps with outside experts, in order to act on it. But how? At the Security Council stakeout, Inner City Press asked the president of the Council for this dwindling month, the UK's John Sawers, if he'd seen the footage and what the UK proposes to do about it. He replied that "first," he was appearing as President of the Council. He said he hadn't yet seen the footage but had read about it. It does seem "disturbing," he said, adding that it should be investigated "in the first instance by the Sri Lanka authorities." Video here, from Minute 6:12. But the Mahinda Rajapaksa administration has already curtailed its investigation into the killing of 17 aid workers of Action Contre La Faim, and declared that its soldiers committed abuses. (Others in the administration have said that winners are never tried for war crimes.) So at this late date to defer to Sri Lanka to investigate the snuff film seems misplaced. Among NGOs working in Sri Lanka, the level of disappointment at the UN and Ban Ki-moon has grown. The groups are meeting one last time with UN country representative Neil Buhne, to urge him to go public with the evidence the UN has compiled. They say that Tamil females in the camps are being used as comfort women. They say that UN has a report showing that many people will die when the monsoon season comes if they remain trapped in the camps. 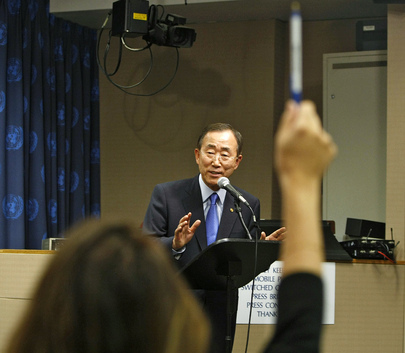 The UN is not releasing this report, they say, asking why Ban Ki-moon appears so beholding to Rajapaksa. In Sri Lanka, the administration is said to be concerned on this by only three things: Delhi's reaction, an upcoming report to the U.S. Congress, and how Rajapaksa is received at the UN General Assembly next month. Watch this site.